This Flannel Friday idea comes from Leah at Sunflower Storytime. She posted this a really long time ago, and I rediscovered it in my Flannelboard idea folder and turned it into a felt version. I am in love with this flannel, but will have to wait until the fall to use it! I am going to make this ASAP. So cute! And will go great in my birds storytime. 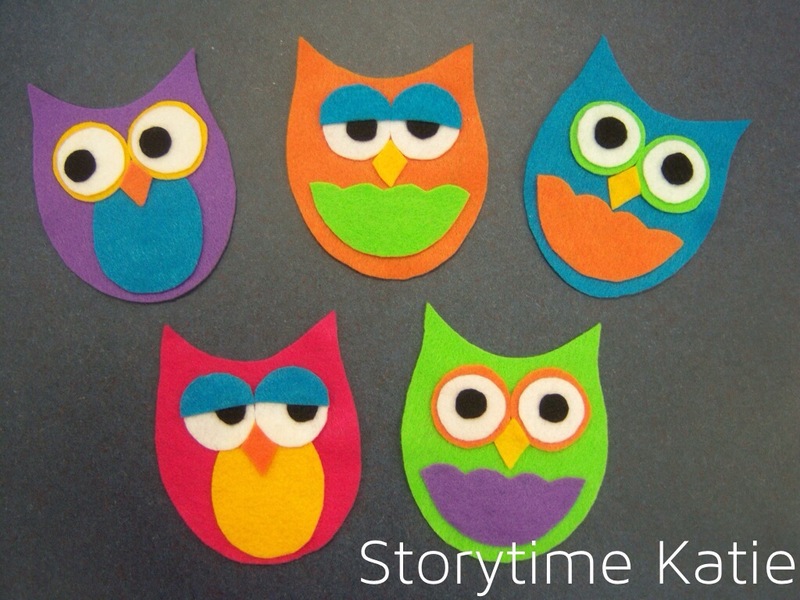 Or Owl storytime – love Owl Babies and Little Owl Lost! I know, there are SO MANY good owl books! I didn’t realize it until I did a birds storytime this spring and kept picking up owl books. I put some aside for this fall though. Love them! So bright and colorful. I made some crocheted owl magnets, but they weren’t near as cute. I’ll be making these very soon. Thank you! I would love to see your crochet magnets — I have a friend who loves owls and those would be a great gift for her. Adorable! I was trying to come up with felt boards for toddlers to use in my camping theme, and I think this will work! Love those eyes! Great colour choices! Katie, the owls looks so cute! I love the bright colors! Such a wonderful craft. We just made our first felt board and we (the kids and myself) were looking for ideas for things to put on it when we came across your site. We were totally inspired! I just have one question, and forgive me if it’s dumb. How do you assemble your pieces? I am currently wearing three bandages after making two owls with hot glue (I’m not the most coordinated with that). But it seemed like the best tool, especially considering what I had on hand. What do you suggest for assembling your adorable felt story pieces? I use Alene’s Tacky Glue. You have to wait a few minutes for the glue to really adhere, but I have not had a flannelboard piece fall apart yet, even after the kids play around with them!